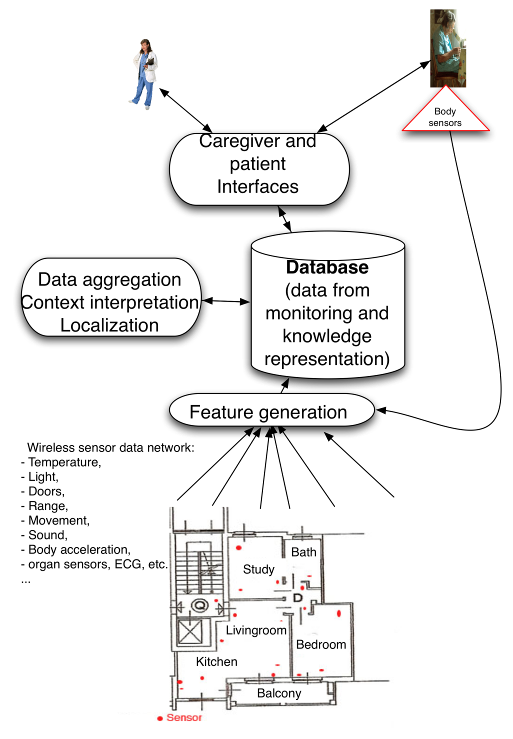 The project aimed to develop a system for non-intrusive monitoring both of behaviour and physical conditions of home-care patients. A wireless sensor network, covering all rooms of the house and allowing to gather and convey information on environment and person. A personal sensor facility placed on belt (accelerometers, compasses, etc..) and worn by the user (ECG sensors) used for the location of the patient, for the identification of particular events (e.g. falls) and the monitoring of vital parameters. As for as the wearable sensors, the MAGIC (Interactive Computerized Shirt) will be used, consisting in a shirt and a sensor-portable electronic module. The shirt has two electrodes, made by conductive fibres appropriately woven which are electrocardiogram originated. Continuous monitoring of the state of the person and living environment. Remote access by qualified personnel or relatives to the information generated by the automatic monitoring. An aid to the management of personal activities. The chance of audio and video communications with specialized personnel, relatives and other people.